Avery Lee Williams was awarded the Membership Global Key & Medallion by Lions Clubs International (LCI) in recognition of his lifetime achievement of recruiting and sponsoring 250 members to the Easton Lions Club of Massachusetts. 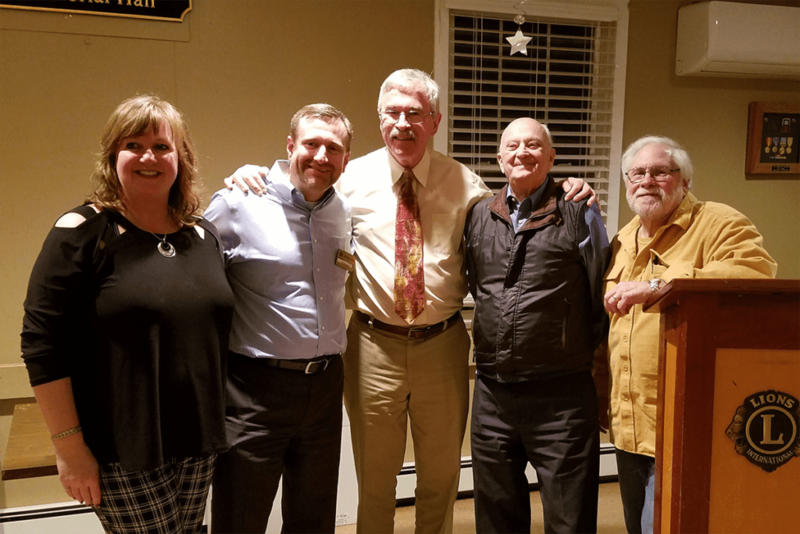 Lee received this notable honor at the Easton Lions Club general meeting on Wednesday, January 23, 2019. Lee also received official citations from the Commonwealth of Massachusetts House of Representatives, presented by House Representative Claire Cronin and the Senate Chamber, presented by Senators Michael Brady and Walter Timilty. Other local dignitaries included Lions Multiple District 33S District Governor (DG) Kathlyn Salem, 1st Vice DG John Babb and 2nd Vice DG Sandy Fife, and Easton Town Selectmen Dottie Fulginiti (Chair), Craig Barger (Vice Chair), Thomas Brussard and Charles King. The LCI Membership Keys recognize individual Lions for the number of new members they invite to serve. The 250 level is a rare achievement. For a member to be counted towards the 250, they must have remained with the Club for at least a year plus a day. Many of Lee’s recruits have stayed with the Club for over a decade. Counting those that stayed less than a year, Mr. Williams has introduced well over 500 people to Lions service. the Lions Thrift Store, now in its 10th year, on the corner of Elm St and Rt 138 next to Buddy’s Villa. He was also instrumental in our Centennial Legacy Project that raised over $40,000 for the Smith Farm at Borderland. Lee, a lifetime member of the Easton community, has contributed to many projects throughout the town, including the shovel hand clock on Main Street, the composting outhouse at NRT’s Sheep Pasture, and the pavilion at Ali’ Park of Eastondale on Pine Street. What’s it like to be a Lion? It’s simple: Where there’s a need, there’s a Lion. There are Lions Clubs in over 200 countries with 47,000 clubs and 1.4 million members helping others and making communities better. To find a club near you, browse the Lions Clubs International site at www.LionsClubs.org - "Start Your Service". John Tracy was also recognized as the Lion Rookie of the Month in December. The Lions Club is a place where willing individuals give their valuable time and effort to improve the lives of our neighbors and children, and to build a strong community. So as Lee always says: Has anyone ever asked you to join the Easton Lions? If not, explore what it means to be an Easton Lion on our website www.EastonLions.org, talk to a Lion, reach out to our Membership Chair, Rob Goodrich, at membership@eastonlions.org. or call Avery Lee Williams, our Chief Recruiter, at 508-345 6544. Rob and Avery would like to invite you to be our "no obligation" guest at an upcoming meeting to meet our active members and get an idea of who we are.